With many Mosquito Joe locations winding down for the winter months, some of our southern locations still experiencing warm temperatures will remain open throughout the year. The average temperatures in southern states will stay consistently between 60 and 70 degrees Fahrenheit, which means mosquitoes will remain active and continue to be a nuisance in the coming months. Mosquito Joe is proud to offer effective and affordable mosquito control services for both residential and commercial spaces. Within 30 minutes of application, our barrier spray eliminates bites for 21 days. Our technicians can treat standing water areas and rid your yard of mosquito larvae, which stops their life cycle right in its tracks. Fleas and ticks shouldn’t be forgotten either! Flea and tick control is another service we offer here at Mosquito Joe. Deer ticks are responsible for spreading Lyme disease, and the number of adult deer ticks is higher in the fall than it is during any other time of year. Fleas also transmit nasty diseases and cause a painful itch for your family and your pets, not to mention they’re really hard to eliminate once they enter your home. Did you know Mosquito Joe can spray your special events? Weddings, barbecues, and reunions are popular events to have sprayed. Whether it’s your home or a favorite venue, preventing mosquitoes from being on your guest list will have your family and friends thanking you on their way out. Remember to call your local Mosquito Joe to make your yard an itch-free space all year round. Mosquitoes can breed and thrive until temperatures are consistently below 50 degrees Fahrenheit, which won’t happen in the south! So contact your local Mosquito Joe for a free quote and information about our mosquito, flea, and tick services. This year National Mosquito Control Awareness Week was June 26-July 2. It is one of the most important weeks during our year for many reasons. We love raising awareness ab out the importance of mosquito control, to educate people about the risks of vector borne illnesses, and of course helping to bring to light solutions to keep your yard healthy and swat-free. 2016 included lots of news headlines about mosquitoes and mosquito control as Zika virus made its way into the United States. According to the Centers for Disease Control and Prevention, as of July 6 there are currently 1,133 travel cases of Zika in the United States and 330 of those are pregnant women. And while no vaccine exists for the virus, experts agree that avoiding mosquitoes is the best way to prevent Zika and keep it from spreading. So, as you can imagine this was a big topic for mosquito control awareness, as it was a much needed conversation. Our mosquito control services have been a welcome added defense against mosquito borne illness this year, and our franchisees have spent a lot of time speaking with their customers about this very subject. As if that weren’t enough, mosquitoes don’t only affect us humans! That’s right, they can affect our furry friends too. Mosquitoes are also known to carry diseases such as heartworm, so it’s important to keep your four legged friends protected too. Fortunately, our barrier treatments help eliminate fleas and ticks as well. By far, the biggest part of the week and the one we most look forward to is giving back as a company. For the fourth year, Mosquito Joe locations across the country partnered with local blood donation centers for our Beat the Bloodsuckers campaign. 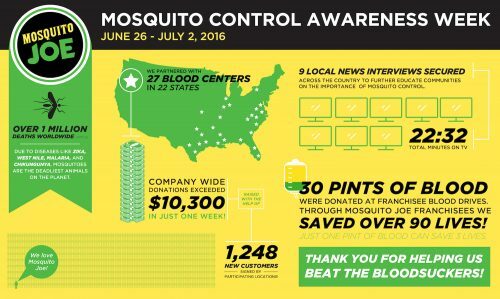 For every new customer that signed up for mosquito control services during Mosquito Control Awareness Week, we donated 10% of the sale to those local blood banks. 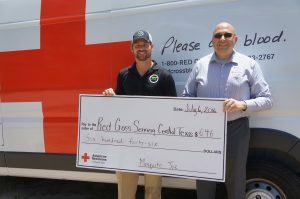 This year we had the privilege of partnering with twenty seven centers across the country and with the American Red Cross being our largest partner, this money is going to help them with the disaster relief they provide every day in our communities. The American Red Cross is always on standby to provide assistance to the military, blood disaster relief to the community, and we feel honored to be able to help with their wonderful cause. Because of our amazing customers, we were also able to donate over $10,300 in just one week to the blood centers we partnered with. We’re so grateful to everyone that made our 2016 Beat the Bloodsuckers campaign the best yet and a giant highlight for us as a company this year. Thanks to our participating franchisees, each blood bank that we partnered with, and our AMAZING customers that helped make this year’s Beat the Bloodsuckers campaign the huge success that it was. It may seem like this cold weather would be a slow time for us here at the corporate office, but that is hardly the case! We’ve stayed busy during the off-season training new Mosquito Joe business owners and are excited to announce several new locations opening this spring. The Mosquito Joe family is growing and we couldn’t be more excited about it. Mosquito Joe of N. Oakland Co.
Mosquito Joe of West St. Louis Co.
Mosquito Joe of N. Prince William Co. If Mosquito Joe hasn’t made it to your neck of the woods yet, why not bring it there? We have opportunities available across the country. If you’re interested in being your neighborhood MoJo (and hero) visit our website for more information.